The Intergovernmental Bureau of Informatics was created, with the name International Computation Center, under the auspices of the United Nations and UNESCO by an international Convention signed on December 6, 1951 in Paris. The Resolutions concerning the establishment of this body were taken by the United Nations and UNESCO in 1946, 1948, 1950 and 1951. The International Computation Center was transformed in three stages (1969-70: reorganization; 1971-72: consolidation; and, from 1978: expansion) into the IBI in order to react to the technological evolution in the field. The IBI had 38 member states which were members either of the United Nations, or of UNESCO, or of one of the other Specialized Agencies of the United Nations. At its sixth extraordinary session, held in Rome on 28 and 29 November 1988, the General Assembly, by resolution R.6E/09 decided that IBI would cease to exist as from 30 November. Dissolution had been made inevitable due to a series of difficulties encountered by IBI with regard to both its programme activities and its own organizational management and administration. These difficulties led to the successive withdrawal of several Member States from 1985 onwards, in particular the three main contributors (France, Spain and Italy) which deprived IBI of all its funding. Lacking resources, and in the throes of an unprecedented administrative crisis, with a temporary Board of Management acting as a Directorate, IBI was dissolved after 26 years spent in promoting co-operation in informatics. The archives of the IBI were offered to UNESCO in 1988 after the dissolution of the organisation. The Director-General of UNESCO accepted the offer and the archivist inspected the records in Rome in 1988. 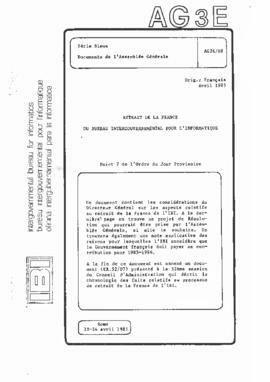 The records were transferred to Paris in 1989, followed by the documents of the Liquidation Committee in 1991. 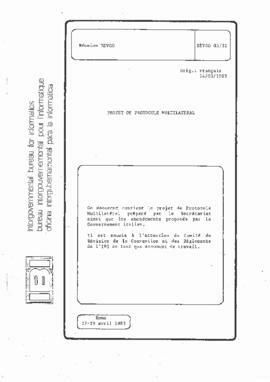 Les documents du fonds, de manière générale, mèlent des documents en langue anglaise, espagnole et anglais dans des proportions égales. Un dossier peut ainsi comporter des documents relatifs à un seul sujet, mais fragmenté en plusieurs langues. Inventories made prior to archival processing in 2011 can be consulted. Created by Julia Pohle, August 2009. Revised slightly AWT July 2011.